This cute little stamp is from the Greeting Farm. I colored her with copics- E 11, 00, 000, R 20, 81,83, in pinks for the Link It Up for Pink Breast Cancer Challenge. These little stamps are fun to color and decorate. I used a paper kit but couldn't find a name on it anywhere. I used a cuttlebug embossing folder and then took memento brown and lightly rubbed it over the embossing. I cut the roses and leaves with the cricut and Flower Shoppe cartridge. I colored the pearls with R83, I used a border edge punch to make a strip of lace down the right side of the card. I will add this card to these challenges. Accessories - SU label punch, Cricut, Cricut cartridge flower shoppe, pearls, neenah white, pink ribbon from Micheals. Thank you all for stopping by, happy creating! Great card love her hair & papers! Very nice work, I love your little roses. Thank you for playing along this week at The Stamping Boutique. Good luck in the challenge and I hope to see you in the next challenge. Precious, darling image and pretty card. Great card! Fabulous design and color and very cute image. Embellies were the perfect touch. 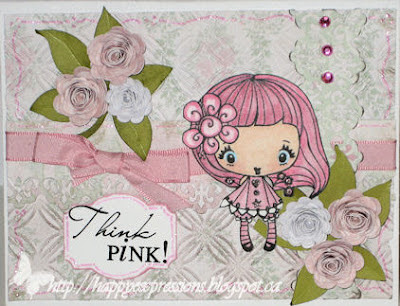 Cute card, love your image and background paper. Thanks for joining us at CTO and Link Up For Pink too!!!!! Such a cute image, love everything about the card. Oh the pink hair is wonderful!! I noticed that right away! I follow the coloring rules too much because I would never have thought of doing that! But, I actually love that detail :) A pretty, pretty card for sure! Super adorable! Thanks for joining us and helping us spread BCA at LUFP! Such a sweet card, thank you for joining us at TTCRD this week. super sweet. TFS with us at CTO this week.